October 22nd 2011: Bonsai4me.com started from very humble beginnings 10 years ago. In those days text-only bonsai forums were the norm and the majority of information concerning bonsai on the internet was very vague to say the least. One thing that I felt was seriously lacking was the ability to visit just one website to learn about bonsai. Bits of information could be garnered here and there on the but it meant sifting through a dozens of poorly informed and sometimes just plain misleading sources. In 2000 I still surfed the internet via my TV and a request for articles on the Bonsaisite forums interested me as I had a large note pad full of notes I had gathered from my own experiences of bonsai, so I decided to type up a couple of articles. When they were then published online I was so pleased with the results and the reaction from other forum members, I decided to keep writing up these notes into a large number of 'Species Guides'. Each Species Guide containing basic care notes for tree and shrub species as wild plants as well as for bonsai. By the Summer of 2001 I had written over 95 Species Guides and a friend, hearing about my unpublished work stepped in and started to build a basic website structure so that I could publish the Species Guides online myself. Initially placed on a free server (replete with homepage advertising banner), Bonsai4me.com was launched on October 22nd 2001. It didn't look great but it worked and within 2 months it was the only place on the internet (at a time when there were over 180,000 pages returned on a Google search for 'bonsai) to carry so many species guides for bonsai in one place. Traffic was still slow though, after all, I just told people on a couple of forums of the website's existence and by the end of 2001 I had amassed a staggering 1000 visits. This is the earliest image I can find of the Bonsai4me.com homepage, from June 2002 (unfortunately the page cannot be fully retrieved anymore and some images are missing). For the next three years Bonsai4me.com became something of a monster for me for which I developed a love/hate relationship! I would often spend 30-40 hours a week writing articles, answering the many e-mails I received each day as a result of enthusiasts reading my articles as well as time spent simply maintaining the website itself. By 2005 the website had grown massively in size with over 300 articles and bonsai galleries. Visitor numbers had climbed to over 1500 unique visitors every day ('unique visitors' are individuals who look at more than one page on a visit to the website, in other words, they are actively reading the website rather than just one article), with almost all of the traffic generated by 'word of mouth', with enthusiasts simply telling each other about the website. However, as traffic to the website grew so did its financial costs, at that point I still had to pay for bandwidth costs out of my own pocket and these costs were growing alarmingly. And so, in 2005 I took the decision to start running advertising to help cover costs. 'Monetizing' bonsai4me.com was something I had always rejected in the past but it had got to the stage where it was essential for the website's survival. A request for donations to keep bonsai4me.com running was answered by a large number of readers and to those that contributed during the following 3 or 4 years, I can only send my express thanks. Bonsai4me.com in June 2005: By this time the homepage had taken on its now-familiar format. Since 2005 Bonsai4me.com has continued to slowly grow and evolve. 2007 saw the launch of ErinBonsai.com, an online shop that is part of the Bonsai4me 'family' selling bonsai pots and bonsai as well as Bonsai4me.mobi, which carries concise versions of the species guides reformatted for mobile phones. Traffic to the website has continued to grow year on year as well; visitors to the website now hit 120,000 unique visitors every month, accessing millions of pages each year. According to data reports I receive from my hosts, visitors to Bonsai4me.com now come in great numbers from all corners of the world including the spiritual homes of bonsai, Japan and China which is something I am very proud of. 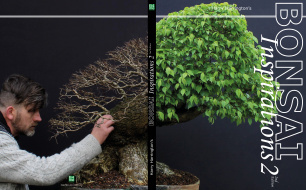 And finally, on December 26 2010, I launched the first book from Bonsai4me.com, 'Bonsai Inspirations', for me, the culmination of 10 years work writing about bonsai.